The Americans by Hugo Munsterberg stands alongside Alexis de Tocqueville's American Democracy as one of the great works on the New World written by a scholar deeply familiar with the Old World. 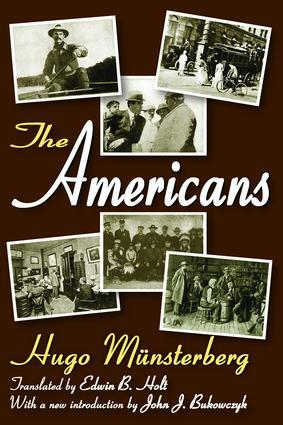 When originally published, it gave the German public a sense of American life, and was described as "a book which deals in a detailed way with the political, economic, intellectual, and social aspects of American culture." Munsterberg, a world-renowned psychologist at the turn of the twentieth century, noted that "its purpose is to interpret systematically the democratic ideals of America. "The primary aim of The Americans is to study the people and America's inner tendencies. It offers a "philosophy of Americanism," the ideology of a people writ whole. Munsterberg's sense of the "spirit" of a people, rather than facts about the people, is revealed in his four cardinal chapters: Self-Direction, Self-Realization, Self-Perfection, and Self-Assertion. While he covers the economic premises of the free market and the politics of party affairs, he considers these the least important. Instead it is the lasting forces and tendencies of American life, rather than problems of the day, that occupy the author. This focus was shared by German readers, for whom the book was conceived, and for those in the United States who read the book in English.The dynamic of strong basic tendencies of democratic forces and lesser, but significant, aristocratic tendencies underwrites the strains and tensions in American society. It also defines the special nature of a book, written more than one hundred years ago, that retains its lively sense of purpose and deep insight into American life. One could well say that this book is required reading in this day and age for Americans and Europeans alike. This is a neglected masterpiece.